Log into your prolific.ac account and navigate to the referrals page. You’ll find your unique referral code, with buttons to quickly share it to Facebook, Twitter or by email. Share this code with interested parties – whether as a participator or as a researcher. Once they’ve signed up, you’ll receive 5% of their first cash out. Get hold of your referring friend’s unique referral link. Follow the link and sign up for a new account. Earn enough money by filling out surveys to make your first cash out. At this point you’ll receive a 5% bonus on top of your first cash out, as will your referring friend. 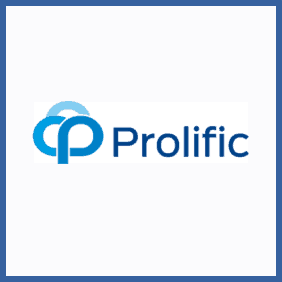 Prolific.ac is a survey site used by academics, brands and researchers worldwide. You can sign up for an account and fill out surveys on a wide array of topics to receive a financial reward. Once you’ve earned over £5 you can cash out to PayPal. Refer a friend and you’ll both receive 5% of that first cashout. If you refer a researcher you’ll receive 10% of the value of their first survey!